Search engine traffic is like manna from heaven. But are you giving away your blog’s precious search engine street cred? If you’re not sure just look at your site’s address. Is it your domain name? Good! Google indexes your web content and identifies it with your site’s domain name. Like here it would be recorded under maduko.com. Many bloggers use free tools like Blogger or WordPress to publish their sites. Most of them are indexed under those domains- great for Blogger, not so great for you. But reassigning that sweet search engine goodness and getting credit for your content is easy. All you have to do is become… Master of Your Domain. Seriously, if you register a domain name and assign it to your blog you’ll immediately take ownership of your content, improve your search engine ranking and see more visitors. The process varies but overall it’s pretty simple. Most domain registrars try to make this easy and cover it in their help files. If not check the support section of your host. For example, Blogger allows you to set up your domain name for free. If you use WordPress.com look at their option to Map An Existing Domain. It only costs $13 per year and is well worth it. No. While a domain redirect might be the easiest way to get your domain name linked to your blog, it is not optimal. That’s because your blog articles still appear under your host’s domain name. Even if you home page appears with your domain in that address bar try clicking on an article link. If it isn’t under your domain you’re still giving away your content. And someone finally got it right. Instead of squinting at a faraway image of an off-the-shelf magazine, or a zoom view of half the cover, I was looking at a purpose-built periodical. At first I thought they might have just set Adobe Acrobat to display the file in spreads. But a closer look revealed the layout was truly situated to take full advantage of the medium. Through the years I’ve seen several attempts to capture the “magazine experience” in a PDF. Some were minor niceties added to the print layout like embedded bookmarks, linked page numbers, etc. Unfortunately there have been other solutions that I found more painful than the problem. Some of these involved bulky viewers that were time-consuming to download and cumbersome to use. Most of them worked on the principle of turning pages. Sorry, but that’s not how a real magazine works. We don’t always turn one. Page. At. A. Time. Besides, there are already little arrows in Adobe Acrobat for previous and next page. Wow! Often I see a story highlighted on the cover of a magazine that sounds interesting and I turn to it and read. Or more accurately, I look for it. And look. Typically I don’t find it the first time through and only stumble on it later. It’s maddening sometimes, and it’s also nothing but a memory in the world of digital publishing. If you download a copy of Winding Road, you’ll be delighted to find the cover articles are linked. So you’re just a click away. 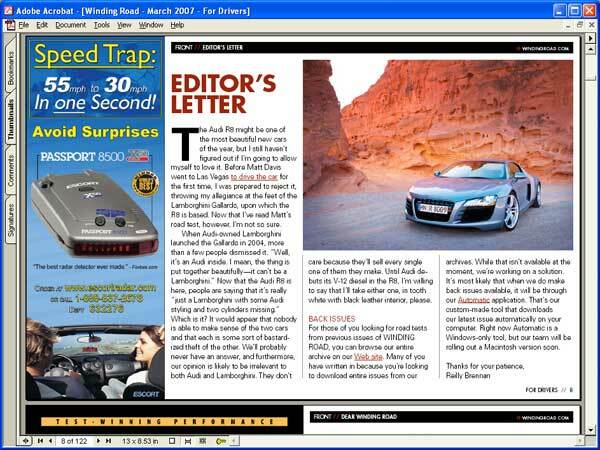 Posted on February 16, 2007 Categories graphics, techTags magazines, publishing, SEOLeave a comment on Magazines to PDF. Finally.